Students in the seventh through tenth grade attend our Confirmation Program on Sundays. These classes build upon the foundation laid in the early grades. 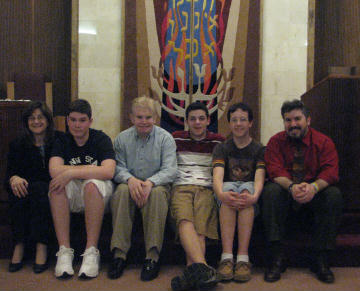 In the Confirmation Program, our students address how to apply all that they have learned and explore how to use the information to build a Jewish life for themselves which will have meaning for them as they face the challenges of adulthood. With the skillful facilitation of our teachers, students wrestle with their view of God, explore different expressions of Judaism and the role of religion in our lives. Our students explore the big questions and strive to find answers for themselves. Group activities and discussions assist students in defining and articulating their values. Teachers promote discussions on the issues facing teens today as well as ethical and moral issues facing society. Teachers provide Jewish texts and source material to inform students of the Jewish values, traditions and teachings which can help students use a Jewish lens in their decision making process. The highlight of this program is the Confirmation year. In tenth grade, the students study with the Rabbi. During this year, they cement the bond that has developed among them and build a special relationship with the Rabbi. During the year, the students attend the L’Takein Seminar presented by the Religious Action Center of the Union for Reform Judaism for four days in Washington D.C.. Students learn about the political issues facing our country and the lobbying process and then actually have the opportunity to lobby our legislators on Capitol Hill on the issues that they choose. The year culminates with the students leading the congregation in worship and sharing the synthesis of what they have learned and they affirm their intention to live Jewishly. Confirmation is a relatively new life cycle celebration emphasizing the importance of continuing one’s formal Jewish education. At age eighty, one attains the age of strength. This statement encapsulates the wisdom that Jewish study is a lifelong pursuit and obligation. Our Confirmation Program provides the opportunity for our students to continue their studies with their friends and within the nurturing structure of our Religious School.